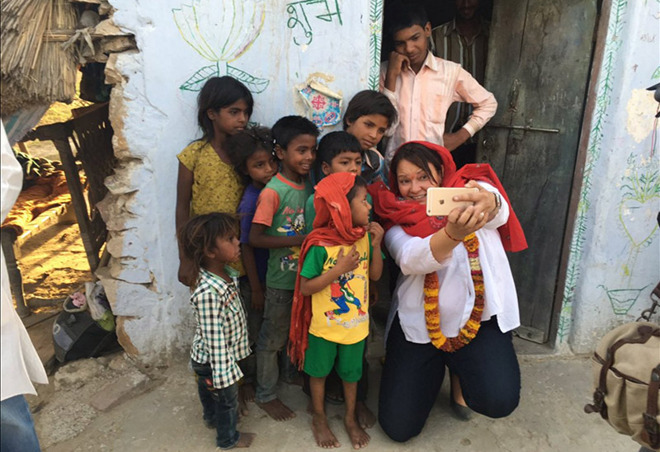 As part of Apple's tour of India, the company's environment and government affairs chief Lisa Jackson visited a school in Rajasthan this week to meet with so-called "solar mamas," or women trained in the manufacture and assembly of solar lamps build solar powered lanterns. On Wednesday, Jackson traveled to Tilonia in the Ajmer district of Rajasthan, a small village best known as the home to The Barefoot College. The non-profit organization was founded by social activist Sanjit "Bunker" Roy and serves as both a school and community outreach center, reports Indio-Asian News Service via Yahoo. Despite its remote location and limited funds, Barefoot College uses iPads to train students in a variety of advanced technology disciplines including photovoltaic engineering projects. Apple India donated 20 iPads and 10 Macs to the school this year, reports The Better India. "Powerful: Visiting amazing solar mamas in Rajasthan and visiting a school using iPads to teach." Jackson said in a tweet. According to the World Intellectual Property Organization (WIPO), the school was founded in 1972. Since the 1990s, students, mostly older semi-literate or illiterate women from developing countries, learn the ins and outs of sophisticated technological systems. In particular, the "solar mamas" Jackson visited are trained to handle PV systems and batteries, build solar lanterns and establish local electronic workshops in their home town to conduct repairs. The effort has helped to significantly improve living conditions in hundreds of villages across the region. Jackson embarked on her Barefoot College detour as Apple CEO Tim Cook and other top executives like COO Jeff Williams conducted business meetings in Mumbai. The visit coincides with the announcement of two major Apple initiatives in the country. Tuesday brought news of an upcoming iOS design and development center in Bengaluru set to open next year, while Apple today announced it will hire up to 4,000 workers to further Maps products at a dedicated development center in Hyderabad.